Apple and Samsung have finally settled a seven-year-long patent dispute, bringing to an end the long-running battle over the design of their rival smartphones. The terms were not disclosed. But it comes weeks after a US jury ordered Samsung to pay Apple $539m (£403m) in damages for copying features of the original iPhone. 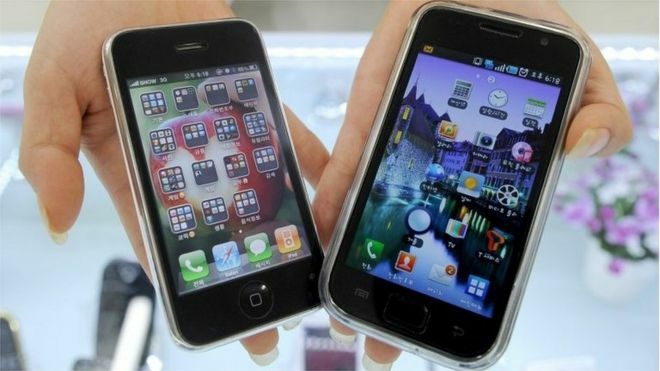 The fight started in 2011, when Apple sued its South Korean competitor, seeking more than $2bn in damages. The suit was the first of many that saw the two companies square off in courts around the world. In 2012, a US jury awarded California-based Apple $1.05bn in damages for the copied features, which included design elements like the screen that displays icons in a grid. Samsung appealed part of that award, taking its case all the way to the Supreme Court, arguing that damages should be limited since patent infringement involved only certain features. In 2016, in a unanimous decision, the Supreme Court agreed, handing a victory to Samsung. But the justices did not rule on the patents themselves, leaving that decision to a lower court. That battle went to trial in May, ending in defeat for Samsung, which had argued that it owed only $28m. Instead the jury set the award at $539m – about $140m more than the figure it had appealed.